Home security in an estate? The point of paying a premium to live in a secure estate is that it is secure. Most residents assume this means their responsibility to look after their own security is therefore transferred to the security team, which residents sometimes support by trying to allocate the minimum budget possible for security. Of course, there will always be a conflict between security and residents. Residents want 100% guaranteed security, which is never possible, while the estate managers want more money to accomplish more in the security realm, to try and get as close to that 100% goal as possible. Nevertheless, the idea of abdicating your security to someone else is appealing, but dangerous. Unless you can afford a 24-hour team of bodyguards, you are unlikely to be untouchable. And even with them, John F. Kennedy would tell you: there is still a risk. So what should estate dwellers do when it comes to their own home security? The fact is, your security teams do a pretty good job of protecting the perimeter and controlling access to the estate. But criminal syndicates are not stupid; they will find ways to get in. The cliché remains true: your security needs to be functioning at 100% capacity all the time, while the criminals can fail 99% of the time and still profit from their 1% success rate. One also needs to consider that more syndicates are setting up shop inside estates, either buying or renting property to give them unhindered access to upmarket homes and goodies. Added to that, there is also the problem of people who seem to think helping themselves to their neighbours’ stuff is fine, and there are kids who are sent out on their own into the safe estate that get up to mischief and vandalism. And the list of potential risks goes on. So securing your home, even in an estate, is a must if you really want peace of mind. The benefit is that you won’t have to worry about perimeter and access control, only your own house. To find out what home security options there are for estate residents, Hi-Tech Security Solutions asked a few people for some insight into products and solutions designed for the consumer market. In many homes, especially the more upmarket homes, the age of the Internet of Things has arrived and people want everything connected. The same will apply to security, and we can see the result of this consumer demand in products that are managed via a smartphone and which can be integrated with other home automation solutions. A simple alarm is simply not on the cards for the connected elite. The benefit of being in an estate, some of which don’t allow home alarms because of the noise factor, is that alarms can be linked to internal control rooms or guard houses. In addition, the owner can easily be alerted on a mobile device or email, and can even view home surveillance cameras from the same device, says Vaughn Tempelhoff from Forbatt SA. While some form of alarm is always a good idea to alert residents to risks, today’s alarms allow for much more than linking a passive and making a noise. Hikvision’s senior technical engineer, Toby Chao, explains that access control, video intercom and smoke/water/door sensors can be added to a modern alarm control panel. They say it makes sense to use your alarm as the medium to blend in and control non-security applications, provided everything is managed and correctly installed. With the rapid expansion of CCTV in Africa and the massive cost lowering initiatives underway by dominant players in this space, the challenge for local manufacturers is not to try and compete with these players, but rather to develop and incorporate platforms and interfaces that allow exchange between services and devices. When it comes to specifying what products they have available that fit the above descriptions, the respondents have a broad selection. Hikvision provides the EZVIZ product range, which includes alarm and CCTV equipment for the consumer market, as well as access control and video intercom devices. The company also acquired Pyronix, a producer of alarm and detector equipment to supplement its home security offering. Chao says all products can be seamlessly integrated into one single platform so that every event is visible. “For example, when a visitor swipes a card to open a door or presses a button to phone the house owner, or even when an intrusion alarm is triggered, users are able to see what’s going on in real time on Hikvision’s client software or mobile app. This either can be a live-view pop-up or an app notification, whichever the user prefers. Chao explains that products from Hikvision are engineered to be easy to install and use, For example, many products support POE (Power over Ethernet), which allows users to simply ‘plug and play’ the equipment. When cameras and an NVR are connected, the backend device automatically finds and activates the cameras, automatically allocating an IP address to make it quite simple, even for users without much IT knowledge. 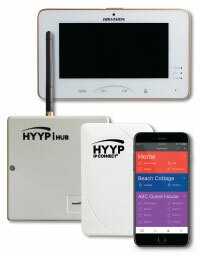 IDS has developed the HYYP Smart Home app which seamlessly integrates with any IDS alarm solution and now allows homeowners the ability to control and have visibility of their alarm status remotely and in real time. The HYYP app allows users to arm, disarm and bypass zones remotely, as well as get notifications should there be a violation, bypass, panic or trouble condition. Today’s estate resident does not need to install security solutions that simply sit there and, hopefully, do nothing. You can gain the benefits of reliable home security while also entering the IoT and home automation world by accessing and controlling a host of other functions from your smartphone. In other words, you can still obtain value from your installation without the ‘grudge purchase’ idea so often associated with security products and solutions. • Forbatt SA, +27 (0)11 469 3598, sales@forbatt.co, www.forbatt.co. • Hikvision South Africa, Evan Liu, +27 (0)10 035 1172, support.africa@hikvision.com, www.hikvision.com. • IDS (Inhep Digital Security), +27 (0)31 705 1373, marketing@idsprotect.com, www.idsprotect.com.